Today we celebrate with GED Grads everywhere. Too many times we take for granted our education and the support we had from family to complete high school, college, or trade school. Get a skill and make your self marketable to employers. 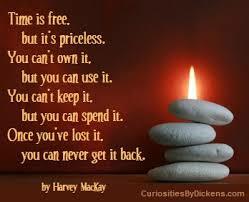 Easier said than done for some who live in our communities. It is very possible that you live or work within steps of someone who struggled in school or didn’t have the support of parents to complete even the most basic education. Those individuals either give up and settle for a minimum wage job (that doesn’t come close to supporting someone) or by their own fortitude they set their goal and found the resources to finish their high school education. Today we say hats off to you. Congratulations on sticking with it and completing your GED. What’s next? Set your next goal and go for it! You may not know us, but there are thousands of us cheering you on. 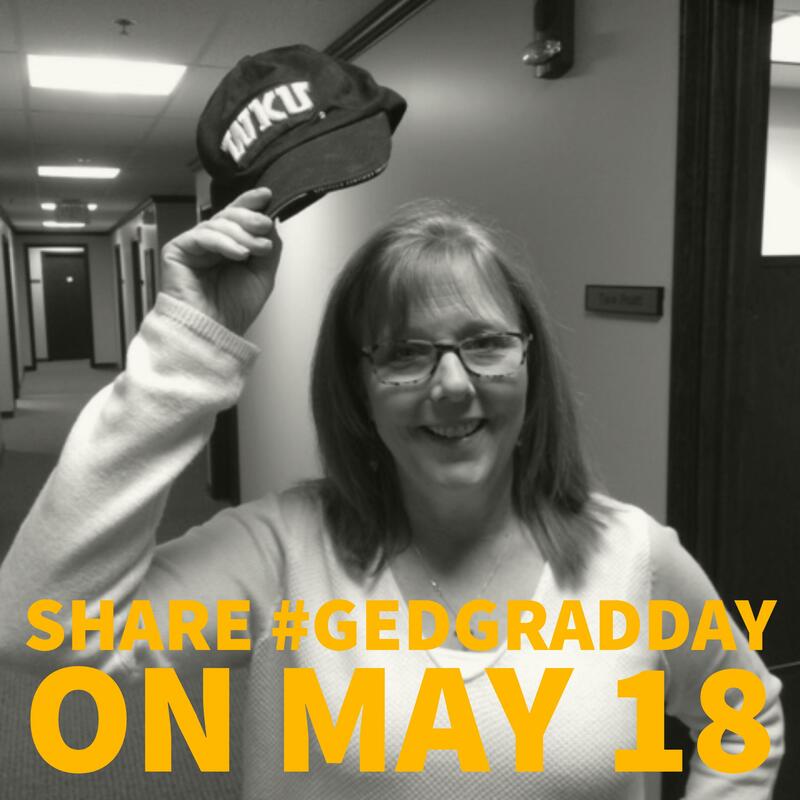 Please share this post with #GEDGradDay and encourage someone today. The day starts early. The temperature is cool but the day promises to be warm. It doesn’t really matter, any weather short of lightning and the players take the field in competition. The boys and girls of the band wander in early because arriving on time is late to these musicians. Bottled water is consumed by the case-load. Hydrate, hydrate, hydrate is the beat of the day. There’s a quiet rumble of voices that increase as the members continue to gather. Roll call — by score — wood winds, brass, drumline, pit — where’s the pit — guard. Flying in from loading their equipment onto the field comes the pit. The four-minute pep talk from the director reminds the band of what they need to work on this morning, their strengths, and their purpose on the field. To perform with excellence for the glory of God. Our band includes kids from 7th to 12th grade. Their skill level may be divided, but not their loyalty to each other and the band as a whole. Experienced members encourage, coach and help the new guys. The older ones know what it feels like to play “under the lights”. They know what it takes to succeed and what it feels like to be defeated. This wisdom isn’t something that can just be talked about, it comes from the medley of emotions that several years in marching band brings. Competition becomes a day when parents and their band kids work in concert with each other. 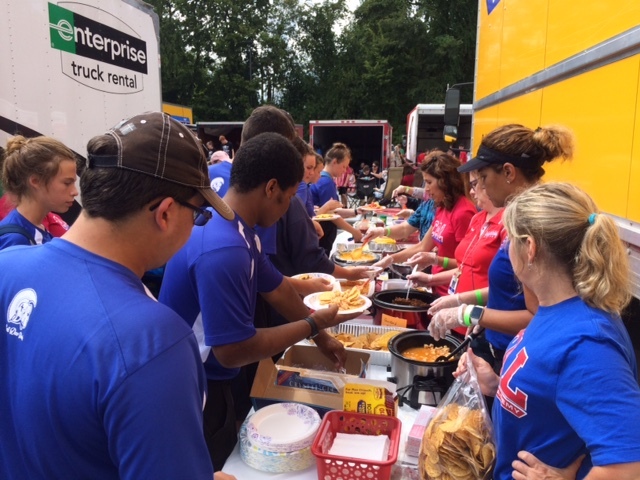 While its the band that earns the score at the competition, the parents feel both the successes and challenges of the day as well. We cheer for the win and we encourage at the failures. The band dads know what’s expected and have the tools to accomplish it. They build, they take apart, they rebuild. But in the middle when there’s a few minutes to spare there’s always time for a few minutes of ball game watching or bocce ball playing. 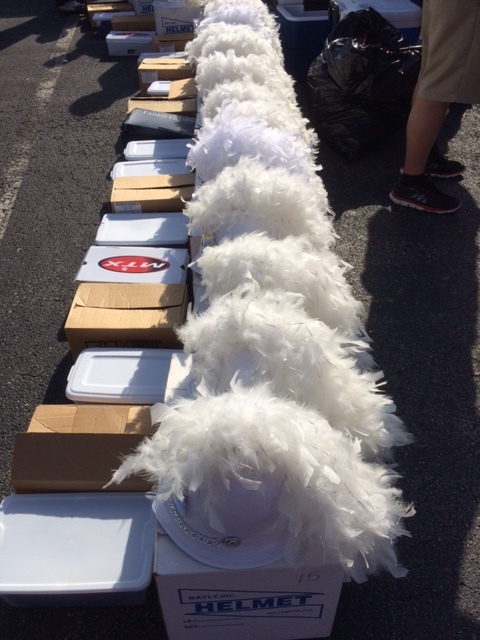 When the band takes the field, the props that support them have been designed, built, packed, moved and removed by the loving hands of their parents. The 26-foot box truck is loaded under the direction of a couple of dads who stand at the ready. Their uniform includes bungee cords, straps and work gloves. They have a plan for maximizing the 1600 cubic feet of space for the half million dollars’ worth of cargo — instruments, props, and uniforms. The symphony of loading is conducted by two men in the truck and others on the ground fulfilling the requested next items to load. The moms march to their own beat. In addition to getting their band kid up and moving, band moms are praying, cooking and sewing their support into the score of the day. The competition day itinerary sets the pace for the moms. The uniform moms have made sure uniforms are clean, hung in alphabetical order along with the shoes and hats. Not to forget fluffing the plumes! Their instruments include a sewing kit, machine and ironing board. Band kids tend to keep growing between July and October. Hard to keep their hems from climbing up their legs. The meal moms have arranged a menu sure to hit all heights of the food pyramid. Always making sure there is more than enough of the tasty cuisine. Lunch is served. Band members come through with complements to all the chefs. The directors and other parent volunteers fall in step with the service. The crescendo of the buffet leaves the mothers whose hands prepared the meal, a few minutes to eat as well. The rest doesn’t last long, a check of the clock and its time to clean and reset for the snack to be served mid-day. The directors spend their day like super bowl coaches, laser focused on the kids and their performance. The competition site has been carefully chosen to allow the band to meet challenging competitors and be judged fairly. Their movements of the day are all about the kids and what they need to be ready to take the field. The band takes the field. 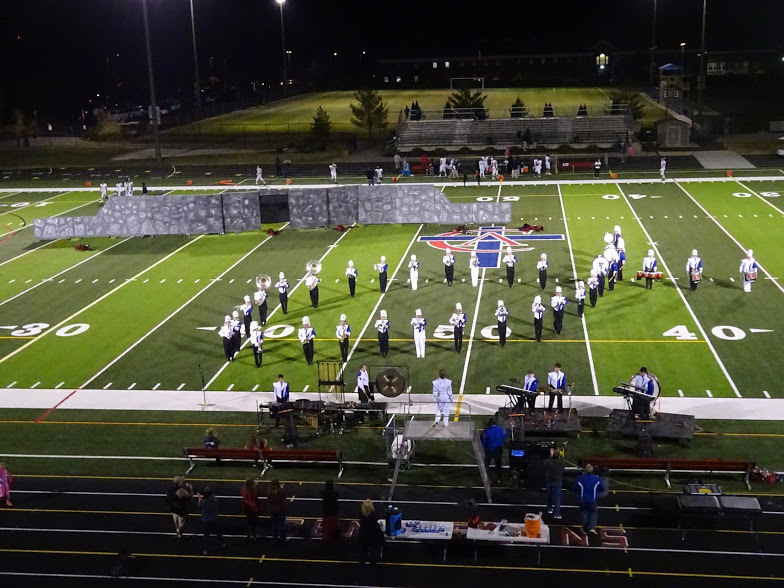 Once the props are in place and band members are on their mark, directors and parents exit the field. Parents are peppered throughout the stands and on the sidelines ready to move props on and off the field. For the next ten minutes it’s all about the kids and their performance. Cheers come throughout for outstanding formations and solos. The last note is played. Their musical message delivered. The success of the day will be measured in the judges’ comments and score. The directors will use the feedback to fine-tune for the coming bigger competitions that earn the band a run at the state finals. Along with the kids, the directors have worked and rehearsed for hundreds of hours. There is no doubt that the band can succeed if they perform at the level the directors know they can. Competition days are long. 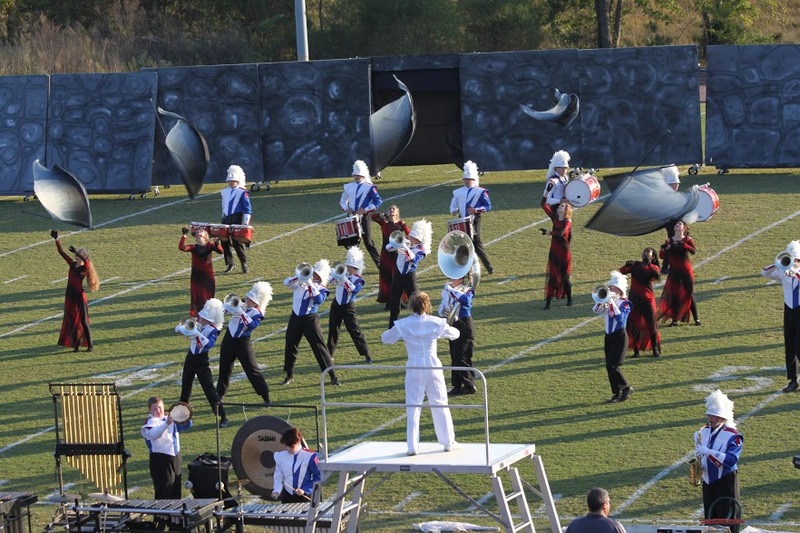 The band kids spend as many as 15 hours together working, traveling, and performing. They step off the bus weary. Drop their backpacks and blankets knowing no one goes home until the truck is unloaded, flags and instruments are put away and they hear final words from their director. Parents are ready to go home, but help with unloading. Final roll call for the day — by score — wood winds, brass, drumline, pit — where’s the pit — guard. The pit crew are the first on and the last in, but they are taking care of their equipment. Theirs aren’t easily tucked into cases. After a few more encouraging comments from the director and instructions about the upcoming week of rehearsal, they are encouraged to get some rest, go to church and be ready for Monday. A prayer is said and the band disperses. Seven clicks of the calendar and they do it all over again. Today cameras are as close as our cell phones. Pretty much at the end of our arms at all times. 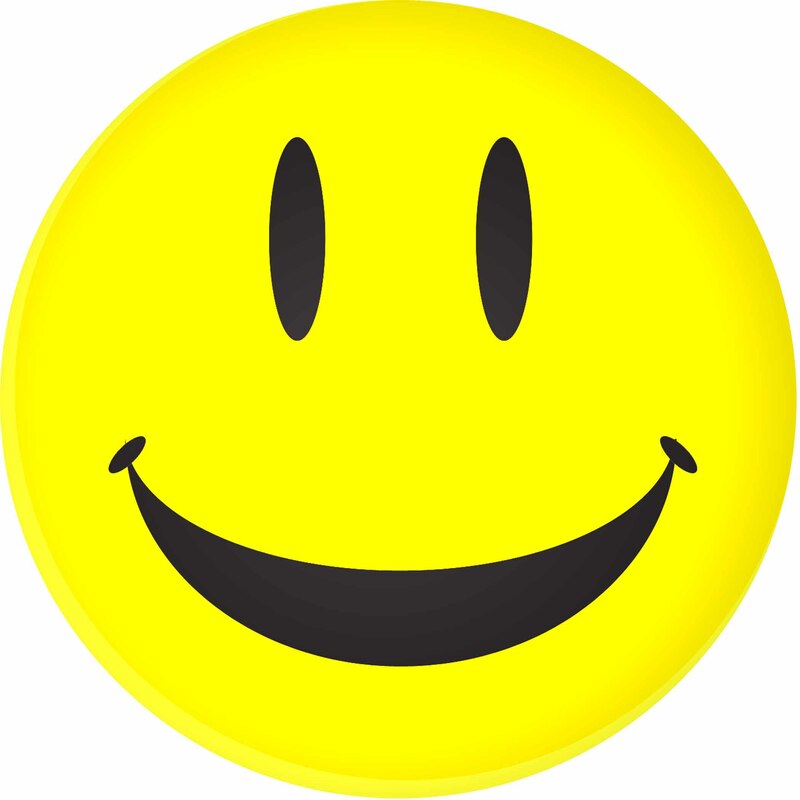 Pictures of meals, pets, gardens and of course our selves are posted, tweeted and shared all over the world. Are we too busy taking pictures of memorable beautiful moments to stop and enjoy the moment? On my way home one evening there had been a summer rain shower. Sitting at a stop light I looked up to see the most beautiful full seven-color spectrum rainbow. Red, orange, yellow, green, blue, indigo and violet. Right in front of me. Admittedly, I started to reach for my phone to snap a photo. I stopped. Instead of taking a picture and posting it, I just enjoyed God’s handiwork. It was a beautiful quiet moment. There is a lot of chatter these days of everyone being too plugged in. We are. We are rushing through our days, living for the weekend and not experiencing the sights, sounds, smells and tastes we encounter. Breathe for a minute. Look around you. What’s new or unusual? What are the stories in the lives of all the people you are rushing by? Take a minute and let me know what you find.